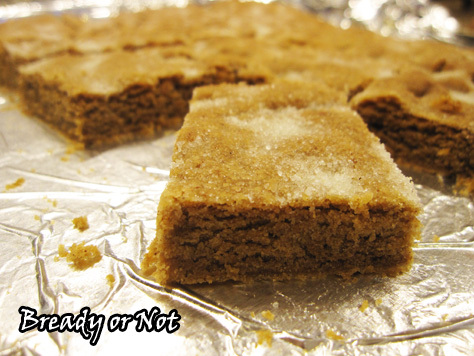 We’re kicking off the Christmas season with a recipe that’s been a favorite of mine since 2003: Soft Gingerbread Bars! My original recipe was clipped from the inside of a Land O Lakes butter box. Before trying that recipe, I had associated gingerbread with dry, hard cut-out cookies. Land O Lakes enlightened me. 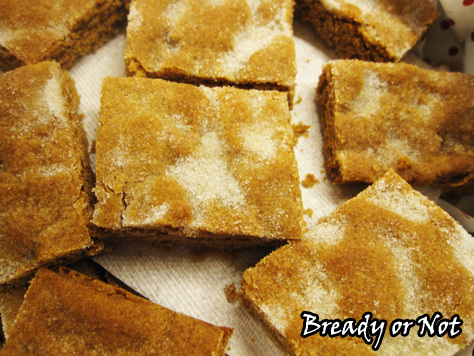 They taught me gingerbread could be rendered into soft, chewy bars that were a sugary equivalent to crack cocaine. These bars have been a household favorite ever since. 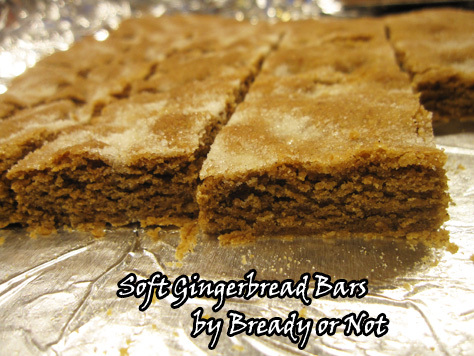 You can cut the gingerbread into fancier shapes, but I prefer basic bars. These bars are soft and luscious, embodied with the divine scent of Christmas itself. Plus, this is the perfect recipe when you’re low on time–it mixes together quickly and bakes in under 20 minutes. No standing around the oven for an hour, waiting for batch after batch of cookies to be done. As soft as these bars are, they are surprisingly durable. When my husband was deployed in the Navy, I mailed several batches to him overseas. I packed them in Gladware with napkins for padding, and they survived the journey, intact and tasty. Modified from the original recipe at Land O Lakes Butter. Originally posted at Bready or Not back in 2012 on Live Journal. 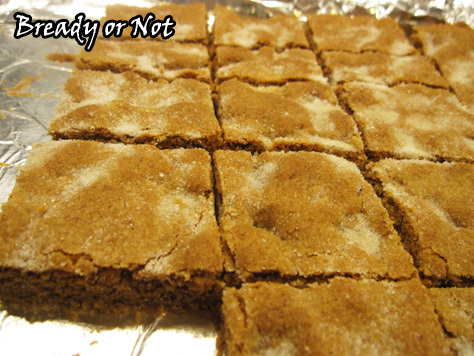 These soft, thick gingerbread bars whip together in no time and bake in under 20 minutes! They are surprisingly durable, too, and keep well for weeks for mailing–even to overseas. Plus, they smell and taste like sugary heaven. Modified from a Land O Lakes recipe. Preheat oven to 350-degrees. Line a jelly roll or large bar pan with aluminum foil. 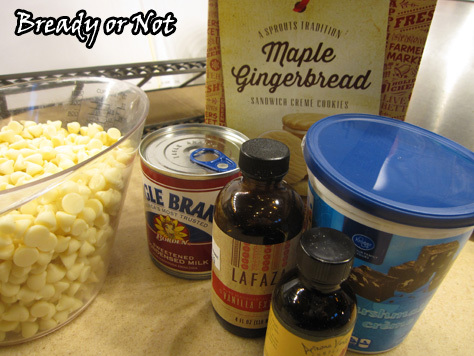 Combine the 1 1/4 cups sugar, butter, egg, and molasses in a large mixer bowl. Mix until creamy. Add the flour, baking soda, and spices and mix until just combined. Press the dough evenly into the pan. Sprinkle a few tablespoons of sugar across the top. Dust the sugar with your fingers to fill the nooks and crannies. Bake the pan for 16 to 20 minutes, or until very lightly browned around the edges. Cool completely. Cut into bars or other shapes. Try to resist eating them all. 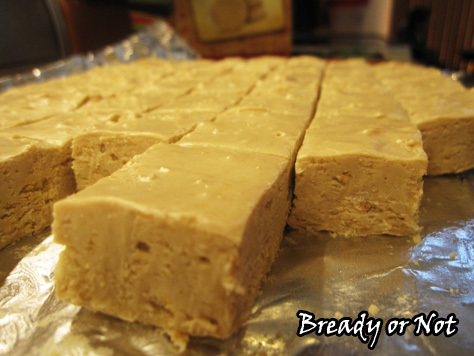 It’s holiday time, so that means it’s time for super-fast microwave Maple Cookie Fudge! Aha! I did indeed. That pumpkin fudge is delicious indeed, with its texture and taste like pumpkin frosting, but it also gets soft if it’s not kept chilled. THIS fudge recipe has endurance. Fortitude. Maple. 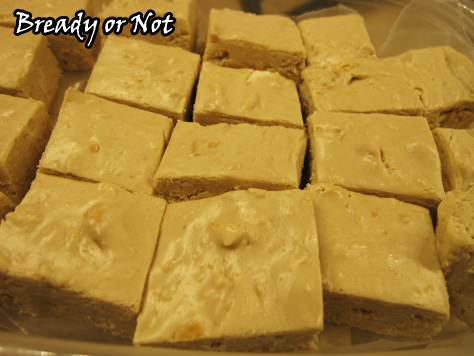 This is a shortcut fudge without any need of a candy thermometer or stress. I like to use the microwave, but you can use the stovetop if you want. 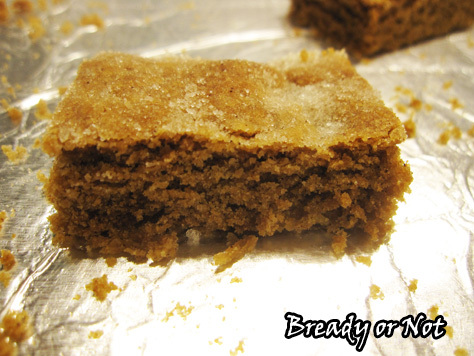 You can keep the maple cookies chunky, if you desire, or grind everything to crumbs–your choice! I actually like some small chunks mixed in for texture. The maple flavor is nice and consistent here, not cloying, while the marshmallow fluff grants the texture some extra oomph. 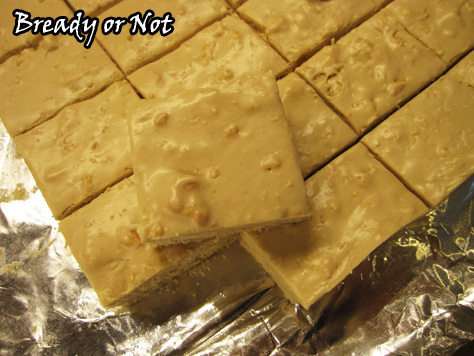 If you want, you can add in some nuts as well, but if you keep your cookies kinda chunky, they can add some nut-like texture to the squares. This would be the perfect quick fudge to make for a holiday party where everything needs to stay out on a counter for hours! The leftovers will keep very well in a sealed container in the fridge, too. 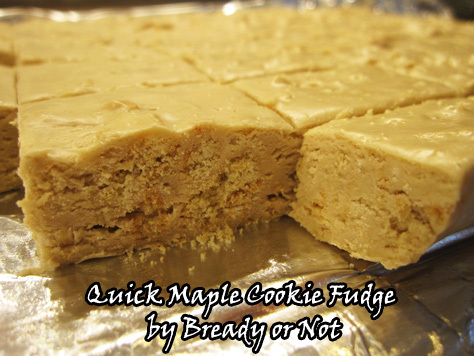 Come to think of it, this maple cookie fudge is just about perfect if you ignore the pesky nutritional side of things. 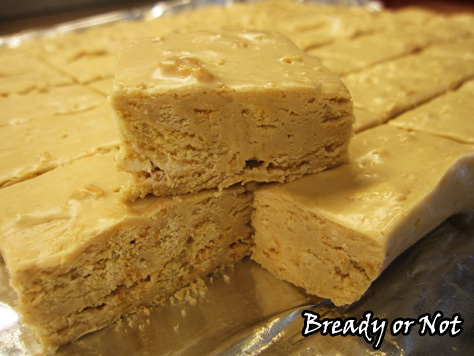 This Bready or Not Original uses maple crème cookies as the base of a fantastic microwave fudge. The fudge should be stored in the fridge, but also keeps very well at room temperature for parties and potlucks. 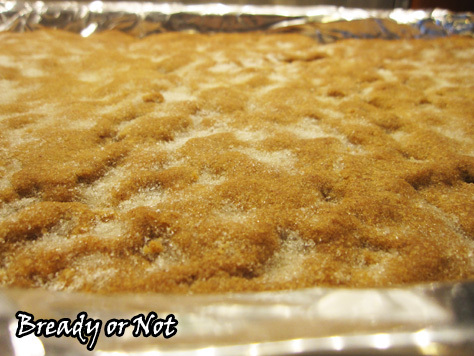 Prepare a 9x13 pan by lining it with foil and applying nonstick spray. Either in microwave or on stovetop, carefully melt chocolate with canned milk and marshmallow cream. If microwaving, do it in short bursts because it can burn fast! Stir often. When the mix is smooth, add the maple flavor and vanilla. Fold in the maple cookies. Use an uneven spatula to smooth out the top. Refrigerate at least 3 hours, until the fudge is firm. Cut into bite size pieces. Keep stored in fridge between layers of wax paper. 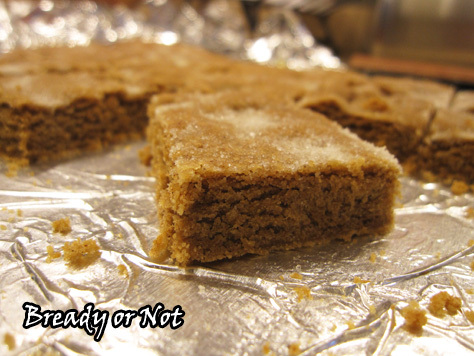 Unlike some other quick fudges, this will keep well for hours at room temperature. 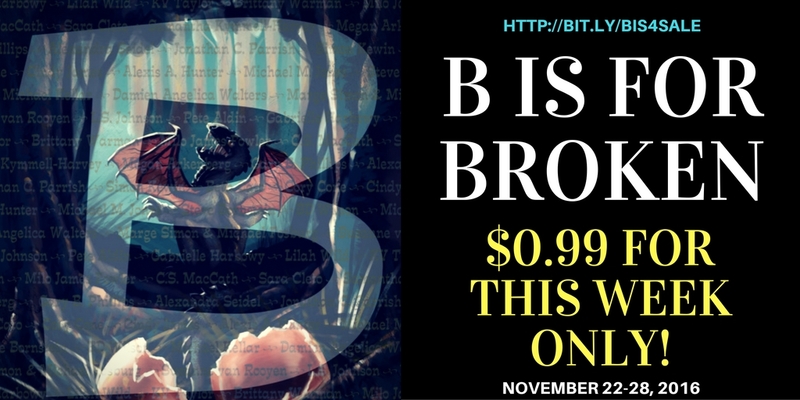 The B is for Broken anthology is on sale for 99-cents today through November 28th over at Kobo! The book features 26 diverse stories around the theme of “broken.” My story is for the letter K, and I won’t say more than that. 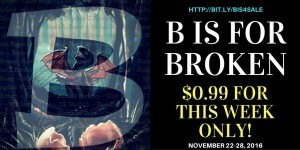 This is a steal of a buy, so grab it at Kobo while this price lasts!